FROM SIENNA PARKWAY NORTH TAKE 3 EXIT ONTO MOUNT LOGAN HEADING EAST, LEFT ONTO PARISH PARK, LEFT ONTO LAFAYETTE WAY, SECOND HOUSE ON THE LEFT. Hello, I’m interested in 9714 Lafayette Way and would like to take a look around. The details on 9714 Lafayette Way: This house located in The Village of Sawmill Lake, Sienna Plantation, TX 77459 is currently for sale for $400,000. 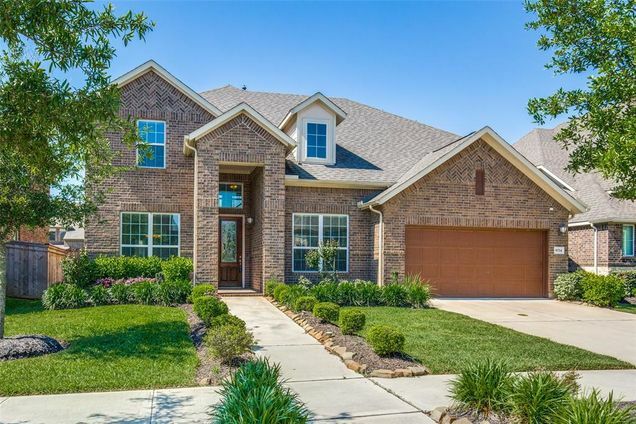 9714 Lafayette Way is a 3,516 square foot house with 4 beds and 3.5 baths that has been on Estately for 6 days. 9714 Lafayette Way is in the The Village of Sawmill Lake neighborhood of Sienna Plantation and has a WalkScore® of 8, making it car-dependent. This house is in the attendance area of Ridge Point High School, Baines Middle School, and Heritage Rose Elementary School.